Timur Shah's Mosque [sic. for tomb, Kabul]. bl.uk > Online Gallery Home	> Online exhibitions	> Asia, Pacific and Africa Collections	> Timur Shah's Mosque [sic. for tomb, Kabul]. 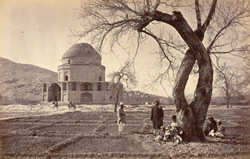 Photograph of the mausoleum of Timur Shah (ruled 1772-1793) taken by John Burke in 1879-80 in Kabul, Afghanistan. In the mid-18th century, Ahmad Shah Durrani unified Afghanistan. His son Timur Shah inherited the kingdom in 1772 and moved the capital from Kandahar to Kabul in 1776. His undecorated and unfinished mausoleum (uncompleted because of the instability after his death) is an octagonal red brick structure, surmounted by a plain brick drum and shallow dome. In 1878 John Burke accompanied the British forces deployed in the Second Afghan War (1878-80), despite being rejected for the role of official photographer. He financed his trip by advance sales of his photographs 'illustrating the advance from Attock to Jellalabad'. Burke's two-year Afghan expedition produced an important visual document of the region where strategies of the Great Game (concerning the territorial rivalry between Britain and Russia) were played out. Coming to India as apothecary with the Royal Engineers, Burke turned professional photographer, in partnership at first with William Baker. Travelling widely in India, they were the main rivals to the better-known Bourne and Shepherd. However, Burke is best known as the first significant photographer of Afghanistan and its people.